As my aging 8 year old desktop became more and more difficult to use, I decided to look into a replacement. Through several conversations with fellow "techy" friends, it became apparent that ChromeOS may be a viable option for me, so the Chromebook showed up on my radar. 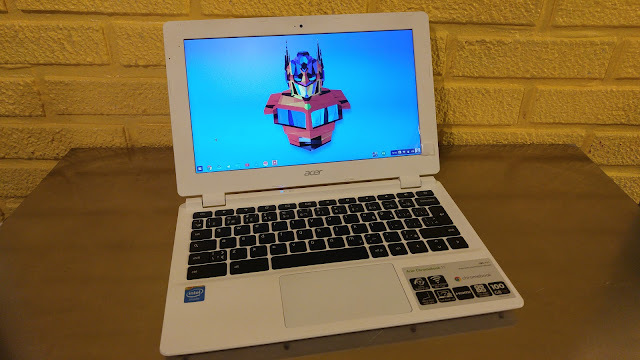 Two weeks ago, I came across what I consider to be an amazing deal on an Acer Chromebook 11 (CB3-111) and I was pleasantly surprised with what I brought home. I found this particular Chromebook at a local Best Buy here in Winnipeg. It was an open box unit, on sale from around $250, to $220. The salesman sold this to me for $180 and told me I could try it out for 14 days. If I don't like it, and don't wreck it, I could return it. No restocking fees or anything. Day 1, remember coming home and feeling like a kid with a new toy. Trying hard to not neglect the family, I slowly but surely set up the Chromebook (with great ease) and added my apps/extensions and signed into websites as the evening progressed. Since I signed into Chrome, many extensions and apps installed on their own. Nice touch. If I can recall from a couple weeks ago, it really only took me 10 minutes or less to get setup and running on the Chromebook. I setup the WiFi, signed into Chrome, and was done. The laptop itself is a really good bang for the buck. It's a simple device that literally shocked me with how well it performs for the tasks I need doing. The screen 11" in size and easily it's worst feature. That's not to say it's terrible, but this is where you can see this is a cheaper device. The viewing angles are bad and it is by no means a sharp picture. That said, it does have a decent resolution to it, so text, images, and video are clear enough. On the left size the CB3-111 has a USB 2.0 port, but on the opposite side is USB 3.0 port. If you're looking to have more space available on top of the 16GB solid state hard drive, you can get a USB 3.0 compatible memory stick or portable hard drive to give you some room with good transfer speeds. On the backside is a port for HDMI - not mini or micro HDMI. I connected my Acer to my TV to see how things would look. I did have trouble getting the picture to carry over, but after I rebooted the laptop while the HDMI cable was plugged in, it worked. I didn't notice any lagging either when using my TV as an extended desktop. I'll also mention an SD card slot is present, so you can easily view and manage photos off your DSLR or point-and-shoot cameras. I know that when this OS was first released, it pretty worked only while you were online. No connection meant there was no using your Chromebook or Chromebox. Thankfully, that's changed. There are tons of extensions now that work offline and allow you to complete a whole plethora of tasks without the need of an internet connection. This includes email, word processing, web developing, games, and more. 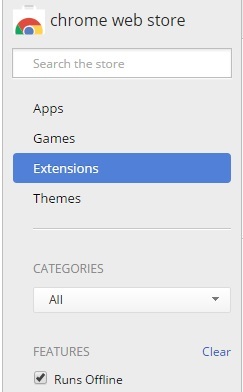 Some of the more known entities, such as Evernote, Wunderlist, and Hangouts have their own windows which make the extension look and act like a full blown app. Feature-wise, there isn't too much that I've come across yet. One feature I do love and use is an option to connect to an Android device to use it as a method to unlock the Chromebook. It has worked flawlessly for these past two weeks without issue. After running a simple setup and pairing my phone to my laptop via Bluetooth, I unlock my smartphone, (right now that would be the LG G4) and my Chromebook is unlocked too! I just wanted to say under its own subheading - this OS is fast. From being completely shut down, to booted up takes my laptop 10 seconds flat. After signing in and browsing the web, 15 seconds. I've tested out the speed of my Chromebook in several ways, such as loading up websites with a very busy interface in a tab, and running a 1080p video in another. It has handled 90% of what I've wanted to do without any complaints, and it has certainly performed better than my 8 year old iMac. The one time I did run into an issue was when I was in an Android Coliseum Hangout, and I attempted to load Google Docs into another tab. This particular Chromebook did not handle it well, and the tab would not load. If my laptop had the option of 4GB RAM rather than 2GB, I feel this wouldn't have been an issue. Again, this is the only time I've experienced an issue. Is ChromeOS right for you? 1. Do you do much outside of the web browser? 3. For what you do use outside of the web browser, is there a web app or Chrome extension you can use instead? 4. Are there alternatives to what you use outside the web browser? Example: Those of you using Microsoft Word may be perfectly fine using Google Docs. Depending on how you answered these questions will help you decide what is best for you. For me, I quit freelance work at home until my kids are older. As such, I never did anything outside the browser, except the official Telegram and Evernote desktop applications - both of which have web apps, and Evernote even has a Chrome extension. When you buy one of the entry level Chromebooks, there are bound to be some drawbacks. However, mine is really only limited to two. The screen itself is quite cheap. While the resolution supports 720p video, the screen itself is quite washed out and has terrible viewing angles. Had this been something I was using for freelance work, it would have never stood a chance. However, for me, it's been fine when writing, browsing, and viewing videos like YouTube or Netflix. 11" for a screen size is also small for my aging eyes. I've been able to setup Chrome to zoom the webpages a bit and increase the font size. This helped dramatically. I also just connect my Chromebook to my TV via HDMI and then the screen isn't even an issue. Also, as I mentioned earlier, I did encounter a hiccup when trying to run a Hangout and Google Docs. I feel the 2GB RAM is a little limiting. Overall, it has been fine, so it is no deal breaker here. For me, I can confidently and happily say I love this Chromebook (especially for the money) and ChromeOS. I do not feel held back by the OS what-so-ever and have been able to accomplish what I've wanted to do with ease, and faster than my old desktop. I have a funny feeling that if the budget allows, I may give my daughter this laptop for learning sake, and I'll be looking at one of the more powerful units in the near year!